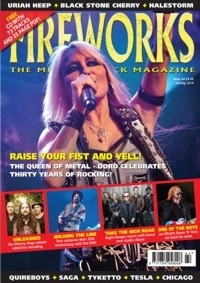 Fireworks #64 has arrived, once again bringing you the best from the Melodic Rock world. With a significant increase in our circulation, we are in celebratory mood - just like German Metal Queen Doro who is currently enjoying a staggering 30 years in the business. Famed Def Leppard frontman Joe Elliot talks about his further adventures with the Down N’ Outz while his bandmate Guy Griffin discusses the new album from The Quireboys. Veterans Uriah Heep are back with a new record while The Winery Dogs talk about their live recording from Japan. Toto are also enjoying playing the live circuit and Steve Lukather talks up their new DVD. That's not all, as we have Night Ranger, Black Stone Cherry, Tesla, Halestorm, Chicago, Tyketto and many, many more - 30 interviews in total! With the usual in-depth reviews of new albums, reissues, books and DVDs, the new issue of Fireworks tells you what’s hot and what’s not. As well as full spreads on some of the Rock Worlds biggest festivals and live events, we also give you a CD attached to the issue which contains 73 tracks in mp3 format - yes, SEVENTY THREE, along with a 25 page PDF about the bands featured, absolutely FREE! All available for a meagre £4.99 - go and get a copy!